OK, APIs are cool, why? Because an API (acronym for Application Programming Interface), is a software intermediary that allows two applications to talk to each other, or in other words, a set of subroutine definitions, protocols, and tools for building application software. In short, an API is a way a vendor gives you to extend his product capabilities to your needs. So, yes, it IS cool. But, is Insights also cool? Other than the cool features (such as system configuration assessment and prescriptive remediate of issues before they become problems, tailored solutions to problems applicable only to your systems) Red Hat Insights already provides you with, it also allows you to extend its capabilities by using its RESTful API, with a programming language of your choice. By default all Insights API resources are represented in application/json format. In addition, it is possible to export reports, inventory and maintenance plans as text/csv. Haven't heard of Red Hat Insights yet? Well, it's time to fix that! Get familiar with Insights in this post today! First of all, you need to choose a programming language to communicate with the API. I am using Python for its simplicity and popularity. These are example scripts and commands. Ensure you review these scripts carefully before use, and replace any variables, user names, passwords, and other information to suit your own deployment. Please note, that in order to work, this script requires the requests and json modules to be installed separately in your Python environment. Now it is time to get our hands dirty by calling the API to retrieve some information from our account. In this example I am using API v1, as this is the version you will find on the official documentation site however, we are currently on v3. Most of the resources did not change between v1 and v3, and in the particular case of this example, it will run fine in all of the versions. So, first we need to authenticate with Red Hat Insights, I will use HTTPS and my account credentials, for that I need to connect to the API using SYS_API variable and the type of query we are going to do (variable payload), as the API tells us to. I only need to call the API with the URL I want to query (SYS_API variable in this case) and include systems (payload variable). After I retrieve all the information relative to systems on my account (in JSON format) I call a function to print it in a nice way. To print the JSON data, I store it on an Python list object (json_report) and then, simply walk through it, displaying the info in different lines and tabulated, so it is easier to read. Fields to be printed are a personal choice, since the object has many more than the ones in this example, in fact, it has all the information related to systems (architecture, OS version, account number, updated date, and a very long etcetera). To retrieve data, initialize the class with a default URL (as the API has to be always queried using an URL that changes with the different options to be queried) and then when the query is done by calling get_insights() method, I simply pass the credentials, method (HTTP or HTTPS) and additional data, when needed. Finally, I review the HTTP response, and if it’s ok, I return the JSON object, so I can print it with the method above. As you can see, querying Red Hat Insights API is quite easy using (in this case) Python and also very flexible; it allows you to extend the capabilities of the product to adapt it to your specific needs. This is a basic example of how to query and retrieve information using the Insights API, but you can also create and delete objects using your Red Hat Insights account by using the API. NOTE: I want to thank Roberto Bergantiños (Software Maintenance Engineer at Red Hat) for co-authoring this post. As explained in my previous post, in Satellite 6.4 Insights integration has gone deeper than ever. With this new release, now Insights remediation playbooks can be executed from within the Satellite Web interface. In this post, we are going to cover how Satellite 6.4 has to be configured in order to do so. Basically, we simply need to allow Foreman to execute commands remotely. This plugin enables Foreman to run arbitrary commands on hosts using different providers. Initially only an SSH provider is supported but we plan to add more. Communication goes through the smart proxy so Foreman does not have to have direct access to the target host and can scale to control many hosts. A command can be customized similarly to provisioning templates or partition tables. A number of templates are included for running basic commands, installing packages, etc. This plugin is installed in Satellite 6.4 by default. Next you have to setup ssh keys. By default smart proxy loads the key from /usr/share/foreman-proxy/.ssh/id_rsa_foreman_proxy. To customize it you can edit the configuration in /etc/foreman-proxy/settings.d/remote_execution_ssh.yml. Without customization you need to create new ssh key and distribute it to target hosts. The key must not use a passphrase. In this post, we are not going to customize it, and use the default location, but just be aware of the options you have. Please note these are NOT root's ssh keys, but specific to foreman-proxy. Finally, you have to refresh the Smart Proxy features in the Foreman. ## mode correctly we set this to yes. The remote hosts need to be configured to accept the private key that the smart proxy is using. Root is used as the default user for accessing remote hosts via SSH. You may set the remote_execution_ssh_user global setting to change the default. If you would like to override at the host group, host, or other level, you may use parameters to do so. Set a parameter called remote_execution_ssh_user. The ssh keys for the smart proxies are available as a host parameter (remote_execution_ssh_keys). This allows you to manage the authorized keys with your configuration management platform of choice, or through a provisioning template. NOTE: This step has to be repeated for all the client machines you want Insights to operate. And that’s all that you need to do, happy remediating! What’s all the fuss about Satellite 6.4? Haven’t you heard the news? Satellite 6.4 gives you the ability to remediate your systems with Insights by executing remediation playbooks directly from the UI. How awesome is that?! In this blog, we’re going to identify and resolve issues with Insights, but this time from the Satellite UI (6.4 required), using Satellite 6.4’s new Ansible capabilities. The first steps are the same as when using Insights in the Customer Portal, which you can read about in previous posts. In fact, the look and feel of the web-based app are exactly the same in the Satellite UI. From the dashboard, you are able to identify the issues affecting your infrastructure at a glance, then jump to individual systems from the hyperlinks. Even the Insights menu is visible in the Satellite main menu. 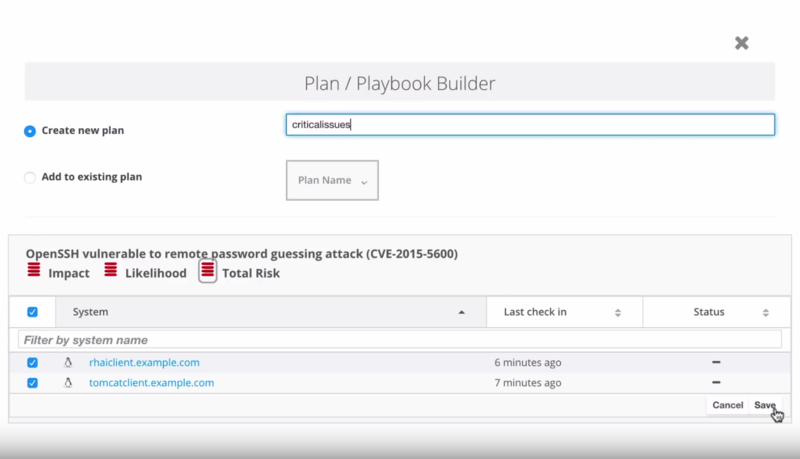 Like in the customer portal, you can see a list of actions along with the likelihood, impact, total risk, systems affected and whether there is an Ansible playbook solution for each of them. And again, as in Customer Portal, clicking on an issue gives us a description, solution, assessment of total risk and risk of change, and impacted systems. Actions available are create a plan / playbook or extend an existing one. This capability was already available on Satellite 6.3. After you choose one of the actions, the plan builder pops up, just like in the customer portal. Notice that it’s the exact look and feel for a better experience (coherence). Here is where all the fun comes!!! When you save your playbook, you’ll see the same summary as in the Customer Portal. But now, there’s no download button, just a drop down menu in which we can choose between downloading, customizing, or running the playbook directly from Satellite UI---with no need to have an ansible server configured!! If you click on “Customize Playbook Run,” you can define parameters for when to run the playbook. When you run the playbook, a visual circle graph lets you know the status of the remediation. The Overview tab shows details about the playbook and the Hosts tab shows greater detail about the remediation on each host. All from the Satellite 6.4 UI!!! Yes; it’s as awesome as it sounds. With the click of a button, you can remediate issues on your systems right from the Satellite UI! So sit back and enjoy your safe day with a coffee! Insights usage varies from customer to customer so there is no real "one size fits all" template. However it is worth highlighting some of the features Red Hat has in place to assist with large sized deployments. This is not intended to be a best-practices guide, just some things to consider. 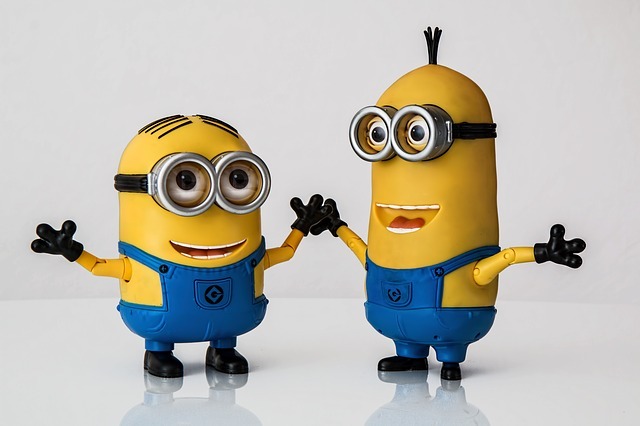 I typically emphasize how easy it is to deploy insights - with it's minimal steps, due to being SaaS; however, for an even easier deployment of Insights on a large scale, Insights has scripts available in Puppet, Chef and Ansible to use along with our getting started guide. If a customer happens to be also managing these systems via a version of Satellite with Insights integration, mass registration of Insights is built in (via the bootstrap script provided with Satellite). A proxy is not required to be used for Insights, but typically the systems of customers with larger scale deployments are already set up to communicate with Red Hat via a proxy, rather than being individually connected (or in disconnected environments). Insights also supports this infrastructure model via proxy support as an option within our client, so there are no changes that you (as the customer) need to make with how your systems communicate with our servers. If you are using a version of Satellite with Insights integration, it can be used as the proxy. By default, Insights sends information once a day. e find that this default frequency fits the needs of most accounts. However, one may have concerns about the impact, at scale, of all these clients checking in and transmitting a payload on your network. To help with this, we have implemented a default, feature to make the Insights client automatically stagger its check-in time; so rather than all checking in at once, they'll check in individually or random groups. All out of the box! And if you want to take it a step further and have full control of your own schedule, the Insights client can be customized via cron (when using RHEL 6) or via systemd (when using RHEL 7.5+). Another capability we put in place is "grouping". Grouping allows you to plan remediation based on your Company’s criteria (purpose, localization, etc), giving you greater control of your infrastructure. Most of these are formed by customers around their workflow. However, some may already have a grouping method in place in other tooling like Satellite or Tower, which they replicate. 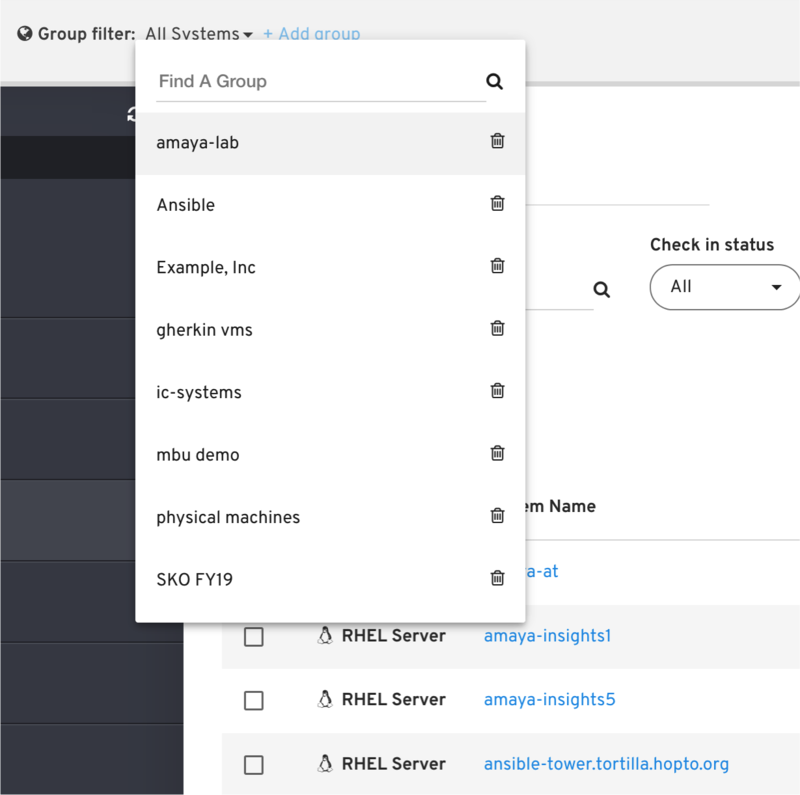 If you are looking to mass group your systems, especially at a large scale, I recommend using the --group functionality in the Insights client upon registration, which allows for quick management and organization of these systems, although you can still do it manually via the UI afterwards. And of course, you can automate this with the methods mentioned before (Ansible, Chef, Puppet). Setting up the systems is one thing to consider at scale, but once Insights is setup and detecting all those problems now on 1000+ systems, how do you take action at scale? Use Ansible remediation with Insights-generated playbooks to coordinate a fix for one or multiple issues impacting your infrastructure. 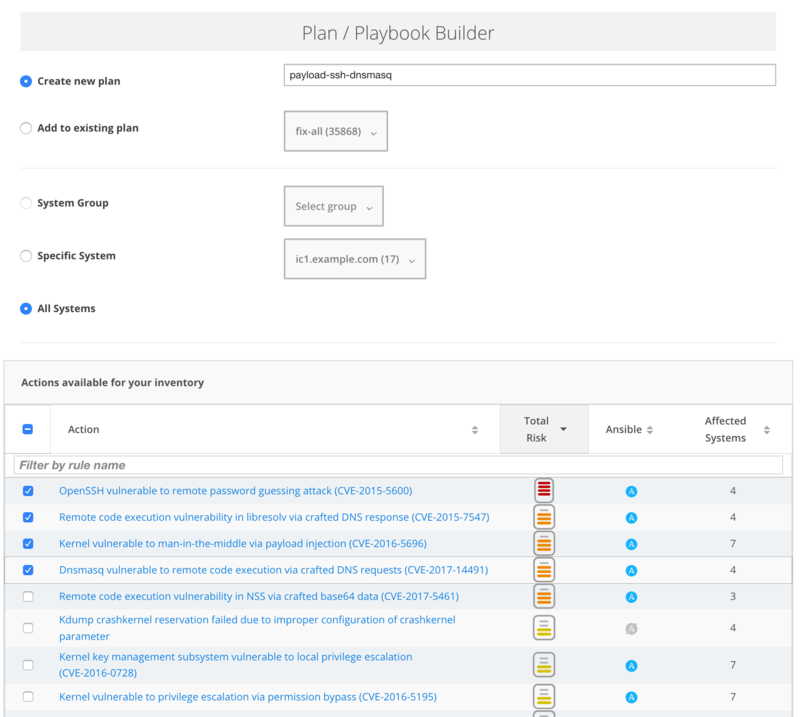 Use Planner to help coordinate planned remediations for actions and systems. Address by severity - Insights applies one of 4 severity (risk) levels to all actions to help you focus on the most important ones. Attack the low hanging fruit - Insights also provides a "Risk of Change" rating for actions depending on the impact of the change on the environment. Remediating actions with the lowest Risk of Change generally won't require any downtime or coordination. One of the most exciting capabilities in Satellite 6.3 is greater integration with Red Hat Insights. Although there are tons of other great features, this one is so important I thought it worth a blog post. Using Red Hat Insights from the Satellite UI is now no different than using it in the Customer Portal. The coolest added feature brings the full functionality of Insights Planner to Satellite (planner itself was added in 6.2). You can now create remediation plans and generate Ansible Playbooks from within Satellite! From there, you can also review and download the playbooks to simply apply them when you’re ready. Wanna know how? Just keep reading! Go to Red Hat Insights -> Planner in your Satellite 6.3 and you'll see the same Insights Planner as is in the Customer Portal. Click "Create a Plan" in the upper-right corner. In the Plan/Playbook Builder, add a name for your plan or playbook. Select the system, systems, or group you want your plan to apply to and the actions you want the plan to solve. Insights may give you different resolution options, based on factors such as the risk of change or down time to the system. Choose the one that best fits your requirements. Once that's done, your plan will pop up so you can review it. It's shown in a very visual way, so you can, at a glance, see the issues affecting the different systems and the total risk that issue represents. Next, download the automatically generated playbook. After a crazy and exciting week of innovations in San Francisco, here I am again to tell you a bit more on how to customize Red Hat Insights to your needs! As explained in my previous post Red Hat Insights 102, you can control the data Red Hat Insights sends to Red Hat servers, how data is sent, and when it is sent. But deviating from the default has its drawbacks too. We want to provide our customers with the necessary options and controls to the data that Insights collects. However, with each modification to the default payload sent to Red Hat, you may adversely change the level of analysis Insights provides about your environment. Since Insights collects what is minimally needed for analysis. Each removal of data from the collection payload can impact our rules capabilities to detect the issue within your infrastructure. Before we continue, I want to add a few words about the differences in commands required for RHEL 6 vs. RHEL 7 systems. This will affect many of the commands shared below. The name of the Red Hat Insights client has changed for RHEL 7.5+ but has not yet done so for RHEL 6. For RHEL 7.5+ users, the name of the client (and all commands and locations that use the name of the client) is insights-client. For older RHEL users, the name and other changes will come to RHEL 6 with the release of RHEL 6.10. For now though, RHEL 6 users should continue to use the legacy client name: redhat-access-insights. Red Hat Insights collects metadata about the runtime configuration of a system (approximately 1% of what would be collected via sosreport during a support case) but this data can be customized, anonymized, blacklisted and obfuscated in the way that you need. Let's dig into the directives from the example above. files: A comma-separated list of files to be excluded. Each element in the list of files must be the absolute path to the file. To ensure exclusion, file names listed here must match exactly what is shown in the collection rules. commands: A comma-separated list of commands that should not be executed and whose output should not be sent. To ensure exclusion, command names listed here must match exactly what is shown in the collection rules. patterns: A comma-separated list of patterns that should not be sent. keywords: A comma-separated list of keywords that should not be sent. Matching keywords will be replaced with the literal keyword. For this option to take effect, the obfuscate option must be set to True in the /etc/redhat-access-insights/redhat-access-insights.conf file. Patterns affect entire lines so any line that includes a matching pattern will not be sent. As explained in my previous blog post, you can validate data to be sent with the redhat-access-insights --no-upload command. Let's take a look at what's collected and sent to Red Hat by the Red Hat Insights client using the default configuration. But what if I don't want to send all that data to Red Hat? Well, let's configure our host so it won't send the previous data. By executing the agent, you can see the list of commands that will be skipped, as specified in the remove.conf file). Red Hat Insights has been designed to ensure that minimal, specific data is collected. We encourage customers to check what is collected with the --no-upload option prior to making modifications. If you want to know about the patterns and files and commands Insights collects data from as well as the the whole list of files and commands that are used to collect data from, you can take a look at this document. Hi again everyone, I'm Will Nix, Technical Evangelist for Red Hat Management & Automation and I'm headed into my 7th year here at Red Hat. I'm really excited for everyone to join us this year at Red Hat Summit 2018 in San Francisco's Moscone center. For the past several years I've presented at Summit, and again this year I'll be presenting in several sessions, labs, and workshops. Check out a really brief description below and join me! Sign up for the events in your Red Hat Summit app, and don't forget to give us feedback on how the sessions went! Learn how to integrate Satellite and Insights systems managment with prescriptive analytics to prevent unplanned downtime and enable secure deployments in your clouds and datacenters. For customers who are operating in connected highly secure environments and want to take advantage of Red Hat's prescriptive analytics and systems management service, Red Hat Insights. A quick 15 minute session on the fastest way to begin monitoring risk in your Red Hat infrastructure. Join us in this lab to see how to use various Red Hat management and platform technologies to automate security in your environments. Choose your own adventure with each of Red Hat's Management technologies in this integrated lab, highlighting Red Hat CloudForms, Red Hat Ansible Tower, Red Hat Insights, and Red Hat Satellite. Bring your own laptop and login to a virtual lab environment where you can test drive Red Hat's latest Satellite 6 to quickly learn how to do content management and prescriptive analytics. One more thing! Drop by the Red Hat Management and Automation booth to check out demo's of Red Hat Ansible Automation technology, Satellite, CloudForms, and Insights. Let us know how we can help you better manage your mission critical environments. Can I control what Red Hat Insights is doing behind the curtains? Red Hat Insights collects metadata about the runtime configuration of a system. The data collected is 1% of what would be collected via sosreport during a support case. The data collected is a subset of an sosreport, so if a sosreport has been approved for usage, Insights data collection should also be acceptable. The Red Hat Insights tool allows customers to review the data being collected by use of a --no-upload parameter. This runs the Insights client & collection, but does not transmit it to Red Hat for analysis. This collection is stored locally in a temporary directory where it can be inspected. That data is sent to Red Hat’s servers over SSL and compared to our Support Knowledge Database, looking for matches, and results sent back to customer, in the form of actions, where they are displayed. 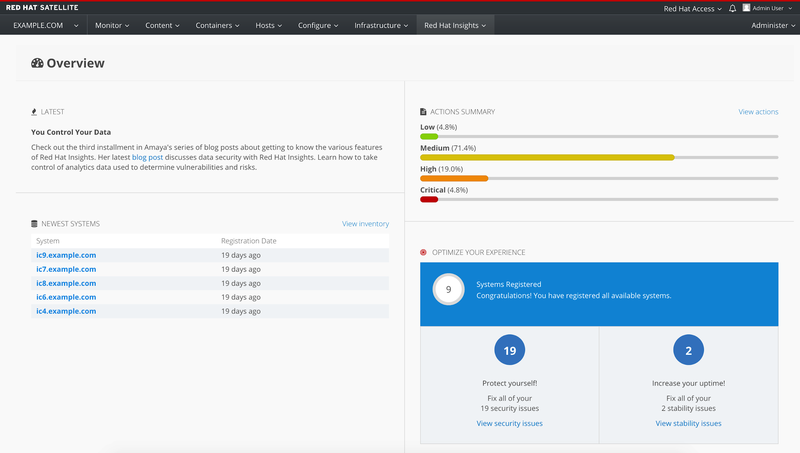 Red Hat Insights registration will auto-detect how the system is registered for software updates and can auto-configure the client based on that information. For auto-configuration, CERT is the default authmethod. Otherwise, authmethod can be set to BASIC, requiring a username and password for the target Insights server (Customer Portal or Satellite). Red Hat Insights uses Satellite server as a Proxy to send diagnostic data to the Customer Portal so requires a connected environment. The log file can be found at /var/log/redhat-access-insights/redhat-access-insights.log. The logs rotate each time data is successfully collected, to .log.1,.2,.n, so be aware that if an upload has occurred since the case was opened, relevant logs might now be in a different file. The log file records the process of collecting data and uploading that data to the Insights server. Insights can be configured by the customer to further restrict what's collected / sent, and optionally to obfuscate hostname and / or IP addresses from reports if desired. Customers can always look at the source code directly from the rpm - everything is made available for their perusal. All data is trimmed down to the minimal necessary facts before being uploaded and encrypted both in transit and at rest. The customer may also choose to alter the name chosen to represent the system in the UI (eg,apache01.prod instead of a fully qualified domain name). Customers can opt-out of sending any data they wish to the service via a configuration blacklist. The service will continue to function, and only health checks which depend on that specific piece of data will be impacted. The Insights client will enable customers to ignore any specific file, keyword or pattern, making data redaction easy to use. The data collected is sent over a secure TLS / https connection. It's encrypted at rest on Red Hat's systems using LUKS encryption, and is kept only until the next report is received, which by default is 24 hours. If another report doesn't arrive in the scan interval period, the data on file (encrypted) is kept for a maximum of 2 weeks and then deleted from our systems. The Red Hat Insights client also provides an easy parameter to obfuscate hostname and IP information. The actual hostname and IP information is replaced with consistent obfuscated names sufficient for rule analysis. As new Insights rules are identified, there may be a need for additional metadata collection for analysis and detection. The list of System Information collected by Red Hat Insights is updated on an as-needed basis. The Red Hat Insights client, upon running, pings Red Hat to determine if any additional metadata is needed for rules which have been introduced since the last run. For example, if a new malware check is added, Insights may need to inspect new data sources to determine if a system is impacted. This automatic check is enabled by default to ensure customers get all new rules and proactive alerts for their system. This ping to Red Hat can be disabled and manually updated via rpm version; however, this may cause customers to miss out on new health checks which depend on new information. When Red Hat updates the collection rules, the rules are GPG signed by the redhat-tools GPG key. The Insights client will immediately abort if this signature cannot be verified. This file is also manually inspected carefully before each update is released. Do not worry! we do not collect the entire messages file, but rather the lines that match a potential rule (i.e. page allocation failure). If you want to know the whole list of commands run and data collected you can take a look at this document. We know you are concerned about the security of your data, yet there are times when it needs to be shared to provide the best capabilities for optimization and management. For this reason I wanted to let you know that the team here at Red Hat understands, and has worked hard to provide you with powerful tools that keep your data safe. Wanna know more?? Find more info here. Happy New Year! One way to get this new year started off right is to get started preventing some of the problems and downtime you may have experienced over the holidays. Using Insights can help future proof your infrastructure with integrated Ansible automation and a report on which systems you still need to patch for vulnerabilities like Meltdown and Spectre. Click here to see if you have systems that are missing the latest patches for these critical vulnerabilities. We're pleased to announce the latest service release of Red Hat Insights. Read below for more information or check out the new features and let us know your thoughts by using the "Provide Feedback" button from within the Insights UI in the top right. For more information about the latest Insights release, refer to our Red Hat Insights Release Notes. In an effort to ease workflow and visibility throughout the Insights application we are shifting to a full screen application mode. This both frees up valuable screen space to more efficiently bring you the latest information on critical threats to your infrastructure, and gives us some more room to continue to add features that you request. Remember, keep the feedback coming, there's a provide feedback button at the top of the user interface. Insights has now enabled our Webhook integration for custom alerts and notifications. 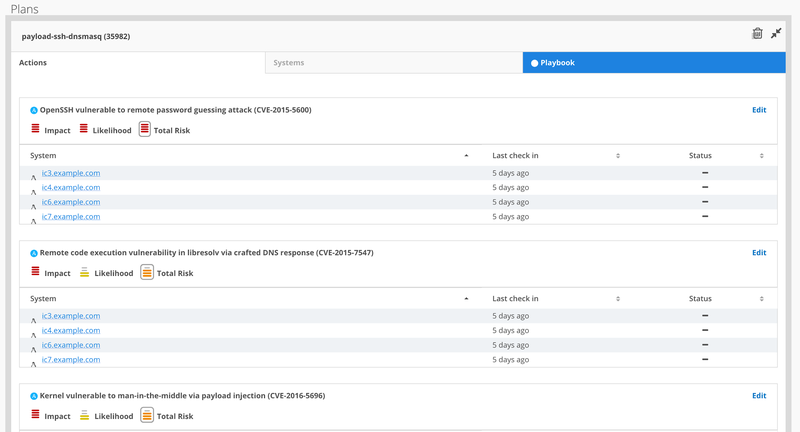 Many of the Incident Management and response services that are used today allow for Webhook consumption which allows for Insights notifications in the tools and workflows you already use. For more information on getting Webhooks configured, please visit Understanding Red Hat Insights - Webhook Integration. Please note, this is example code and is not officially supported by Red Hat. We previously added support for Jenkins and CI/CD workflow integration and now we have published some quick start example code. This code is available at https://github.com/RedHatInsights/insights-CI-examples/tree/master/examples/jenkins and we will have additional related materials coming soon right here on our blog. And to wrap up what's new in this service release, we've added a new widget to the UI with the latest rule additions to the Insights service. 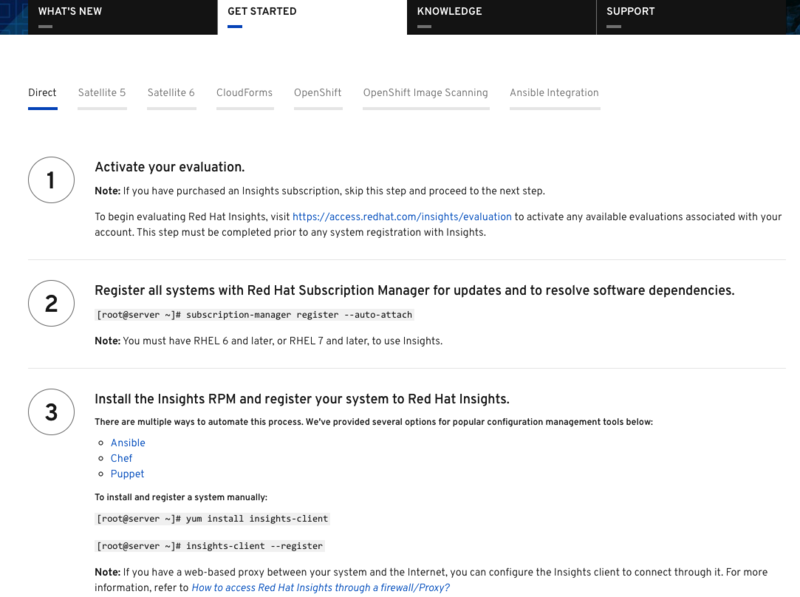 Since rules are constantly being added to Red Hat Insights on a regular basis you can now stay up to date with the latest additions on the Overview page. Additional filtering controls around when a rule was added have also been added to our rules page. Thanks for your feedback and helping continue to improve the Insights service. Have a great new year!